UNITED NATIONS, January 26, updated below -- Amid calls for and claims of UN reform, Secretary General Ban Ki-moon on Wednesday belatedly confirmed he is ousting his Tanzanian Deputy Asha-Rose Migiro, Angela Kane of Germany as his head of Management, and Vijay Nambiar of India as his chief of staff. Inner City Press had previously reported each of these, most recently identifying Susana Malcorra of Argentina as Migiro's replacement. When Inner City Press asked on January 23, Ban's spokesman Martin Nesirky said he had not seen the Tanzanian newspaper which picked up Inner City Press' story. Now a range of well-placed sources have painted for Inner City Press Ban Ki-moon's next steps. Rather than the top UN Disarmament post, for which there is better qualified outside interest, Angela Kane is said to be destined for the UN Economic Commission for Europe post vacated by Jan Kubis. A third American name has surfaced for the Department of Management post Kane is losing. As a savvy Deputy Permanent Representative told Inner City Press, Patrick "Kennedy is the one, leaving as you've reported the contest for [the] D[epartment of] P[olitical] A[ffairs] between Jane Holl Lute and Alejandro Wolff." Other sources say that Wolff's so far short service as US Ambassador in Chile is an issue. Within DPA, transition projects initially premised on American B. Lynn Pascoe leaving at the end of February have now been delayed to the end of May. The Deputy Permanent Representative continued, "the UK is getting frozen out. They can't get back DPA. So they want for Nambiar's chief of staff post their Perm Rep here, Mark Lyall Grant." Under the USG theory, the UK getting the Chief of Staff post would mean Valerie Amos would vacate the USG post at the UN Office for the Coordination of Humanitarian Affairs. Japan could retake OCHA, as it is losing Kiyo Akasaka atop the Department of Public Information. On December 5 without taking any questions, Vijay Nambiar announced that Sha Zukang of the Department of Social and Economic Affairs and Shabaan Shabaan of the Department of General Assembly and Conference Affairs would leave after Rio + 20. Sources say Sha would like to stay - but that a direct pull back from Nambiar's December 5 announcement "wouldn't look right." They say, why not Sha laterally, a la Nambiar and Kane, to DGACM, with "the other Egyptian, Maged Abdelaziz, taking over DESA?" Maged Abdelaziz is a big player for the Group of 77 and the Non Aligned Movement, now on Rio + 20 and in December on the UN budget. Exemplifying how countries use "their" UN Secretariat officials, sources say that in December with Argentina still chairing G-77, the Argentine mission asked the Argentine head of the Department of Field Support Susana Malcorra to "get involved," for G-77. To replace Malcorra at DFS, rather than moving as many think Ban should to a national of a major Troop Contributing Country, sources point to a candidate they call "homegrown" - that is, already in the UN and DFS. But the candidate they name is another American: Tony Banbury. When Ban gave his reform speech on January 25, which many Permanent Representatives panned to ICP, US ambassador for Management Joseph Torsella tweeted excitedly about it. Some link this to the number of USG posts that the US is seeking, in seeming contradiction to Torsella's criticism in other contexts of "closed" slates, positions pre-dedicated to particular countries. Ban himself is said by sources close to him to be particularly concerned with South Koreans. How and where to keep Information Technology chief Choi, and "another Choi"? A close source self described as "outraged" at Ban Ki-moon's personnel practices told Inner City Press disgustedly, "Ban's staffer Isabel is a relative of his wife," amid much head shaking. Unlike the denial of "Mark Lyall Grant as USG" stated above, we have no denial or confirmation of this last from Ban or his spokesperson's office, which has refused to confirm or deny or even take questions on the simplest of facts, even after answers have on camera been promised. This is Ban's UN - watch this site. Update of January 31, 10:40 am: we have just received from Ban Ki-moon's Office of the Spokesperson the following denial of the paragraph above, and immediately publish it: "This assertion about a member of the Secretary-General's staff is totally baseless and untrue." 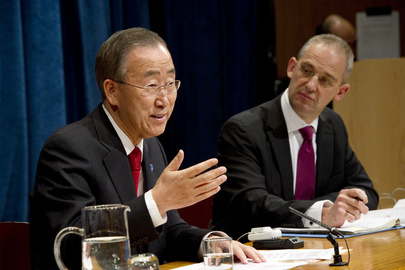 Simultaneous, repeated requests for example for the date on which Ban Ki-moon was notified that the UN in South Sudan had no helicopters and the date on which he started "begging" for them, as well as the date promised by Ban's envoy Hilde Johnson in response to Inner City Press' request in her January 23 video briefing, have still not been provided. When they are, they too will be published.